The sour cherries and the black cherries are put to macerate separately with their skins and stones in extra fine alcohol. After a number of weeks in the cool darkness of the tanks, the fruit has impregnated the liquid with its aroma and colour. 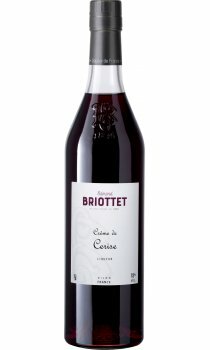 By blending these different types of cherry Briottet obtain a bouquet that ideally releases its roundness mixed with the taste of its stone and the freshness of the cherry picked from the orchard. Briottet's Creme de Cerise is delicious served with white wines, cremants and champagnes, or it can be included in a number of cocktails.